If I had asked you to identify what are the most important organs of the human body, you are very likely to miss out on "microbiome". Though in a traditional textbook sense we never think of Microbiome as a part of the human body there is growing evidence and debate that perhaps microbiome contributes to the human gene pool. Some scientists have begun calling it a "virtual endocrine organ", thanks to many of the chemicals that they contribute. The concept that human is a holobiont and has implications on physiology is overwhelmingly taking over. 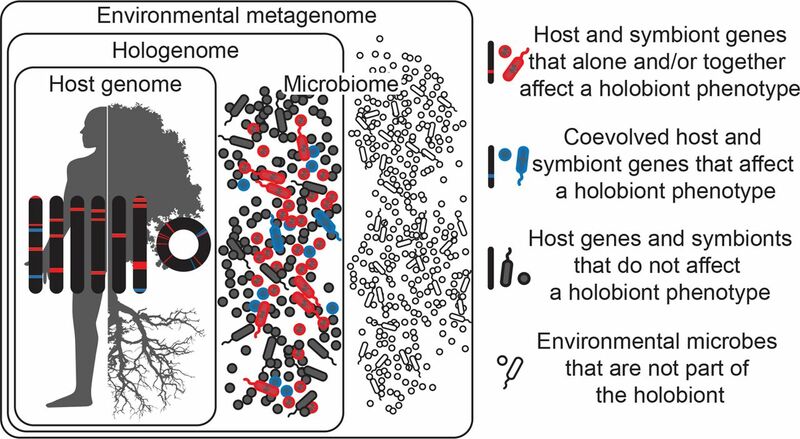 The point of this post is not to discuss the concept of humans being a holobiont, but to talk about a recent paper on the importance of gut microbiome in mental health. If you haven't read my previous posts on this topic, I suggest you read my earlier posts here and here. Fig 2: Associations between QoL scores or depression and bacterial genera. Papers that have been published on the relationship between the microbiome and mental health have studied a few small numbers of cases which brings into question as to how valid the studies are in reality. So, a group of Dutch microbiologists from VIB-KU Leuven Center for Microbiology decided to look bioinformatically into the microbiome of 1,054 individuals enrolled in the Flemish Gut Flora Project (FGFP) and correlated their findings with the quality of life (QoL). They discovered that people presenting with depression had depleted levels of two bacteria- Coprococcus species and Dialister species irrespective of antidepressants. They also validated their results against a second independent cohort of 1,063 individuals from the Dutch LifeLinesDEEP (LLD) cohort and in a cohort of clinically depressed patients at the University Hospitals Leuven, Belgium. Fig 2 from the paper, shows a summary of microbial associations. With some additional bioinformatic analysis, they specifically looked for the presence of Bacteroides enterotype 2, which was based on their previous publication (Link) and found they indeed had a significant association with depression. 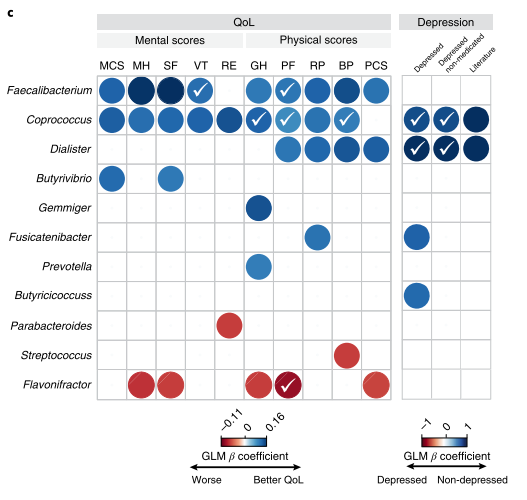 Jeroen Raes summarises the findings in his comment, "The relationship between gut microbial metabolism and mental health is a controversial topic in microbiome research. The notion that microbial metabolites can interact with our brain – and thus behaviour and feelings – is intriguing, but gut microbiome-brain communication has mostly been explored in animal models, with human research lagging behind. In our population-level study we identified several groups of bacteria that co-varied with human depression and QoL across populations. This finding adds more evidence pointing to the potentially dysbiotic nature of the Bacteroides 2 enterotype we identified earlier. Apparently, microbial communities that can be linked to intestinal inflammation and reduced wellbeing share a set of common features." A small digression. Dialister species is known with reference to humans for some time as a potential pathogen, though very rare. They are small, anaerobic or microaerophilic gram-negative coccobacilli found to be involved with oral infections such as periodontitis, acute necrotizing ulcerative gingivitis, and endodontic infections especially D. pneumosintes and D. invisus. Other known human pathogens include D micraerophilus and D propionicifaciens. Coprococcus species are gram positive, anaerobic cocci knwon for its butyrate-producing capacity is a member of Clostridia group known to be a part of the human gut microbiome and found in faecal microbiome. Currently, three species are known- Coprococcus catus, Coprococcus comes and Coprococcus eutactus. 3. Histamine synthesis (Negative correlation). However, when the findings were validated against the LLD metagenomic database, they found that only DOPAC synthesis could be replicated. Though Coprococcus did not have a genetic system to directly synthesise DOPAC, there were genes for converting 3,4-dihydroxy phenylacetaldehyde to DOPAC, in the genomes of Coprococcus comes and Coprococcus catus. As the first author Mireia Valles-Colomer simplifies it, “Many neuroactive compounds are produced in the human gut. We wanted to see which gut microbes could participate in producing, degrading, or modifying these molecules. Our toolbox not only allows to identify the different bacteria that could play a role in mental health conditions but also the mechanisms potentially involved in this interaction with the host. For example, we found that the ability of microorganisms to produce DOPAC, a metabolite of the human neurotransmitter dopamine, was associated with better mental quality of life." There is a word of caution associated with these studies. The current paper is completely a computational-based study and they need to be validated. However, they do give a lead into the understanding that microbes are significantly connected with mental health and probably their gene pool contributes to human neuro-metabolism through the principle of holobiosis.